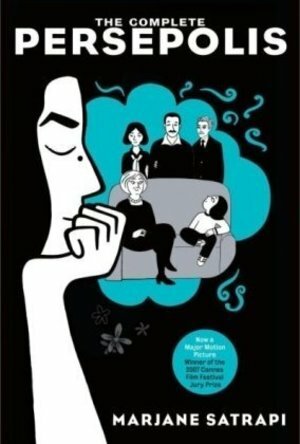 Here, in one volume: Marjane Satrapi's best-selling, internationally acclaimed memoir-in-comic-strips.Persepolis is the story of Satrapi's unforgettable childhood and coming of age within a large and loving family in Tehran during the Islamic Revolution; of the contradictions between private life and public life in a country plagued by political upheaval; of her high school years in Vienna facing the trials of adolescence far from her family; of her homecoming--both sweet and terrible; and, finally, of her self-imposed exile from her beloved homeland. It is the chronicle of a girlhood and adolescence at once outrageous and familiar, a young life entwined with the history of her country yet filled with the universal trials and joys of growing up.Edgy, searingly observant, and candid, often heartbreaking but threaded throughout with raw humor and hard-earned wisdom--Persepolis is a stunning work from one of the most highly regarded, singularly talented graphic artists at work today. well, here you are, my one hundredth book. An amazing read that really helped me learn a lot about Iran (a place I know much too little about). Really amazing. A wonderful coming of age story and a reckoning with history and heritige told with humor, warmth, and incisive wit. This was an interesting look at a life in Iran told by the great-granddaughter of the last emperor, she grows up in a country full of turmoil, a country going through growing pains which are making everything very complicated and war allows fundamentalism take charge. She documents the changes, while being in a situation where she can escape it, for at least a while, until homesickness drags her home again. She points at the contradictions and the problems. a book club read. One girl's experience of growing up in Iran during the 80s and 90s, told through pictures and words (cf. Maus). Warts and all, with no whitewash or glossing over. My first graphic novel. I thought it was a great read that also provides some insight into an Iranian girl's experience.